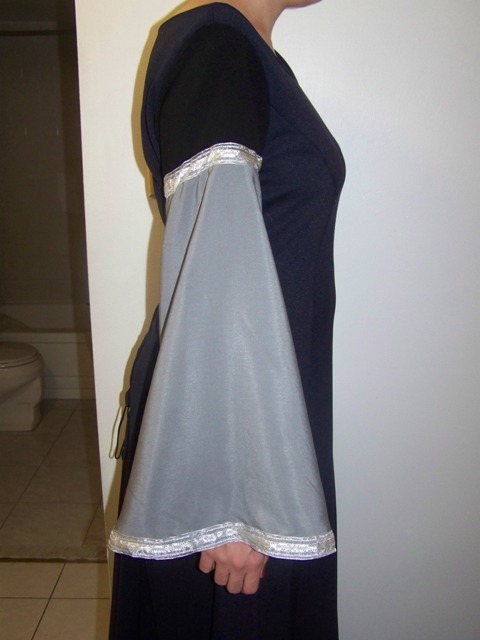 I promised my friends that I would make them some elven gowns for the upcoming Hobbit movie. This is the first gown I made for a friend. 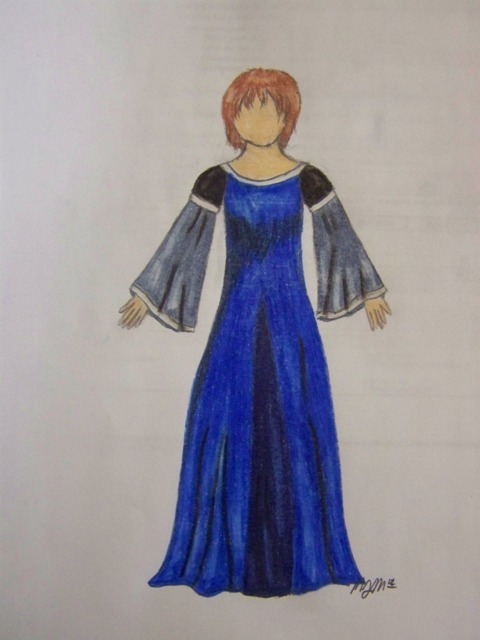 Seeing as there are no female characters in the the Hobbit I decided to name this gown Este after the Valier. 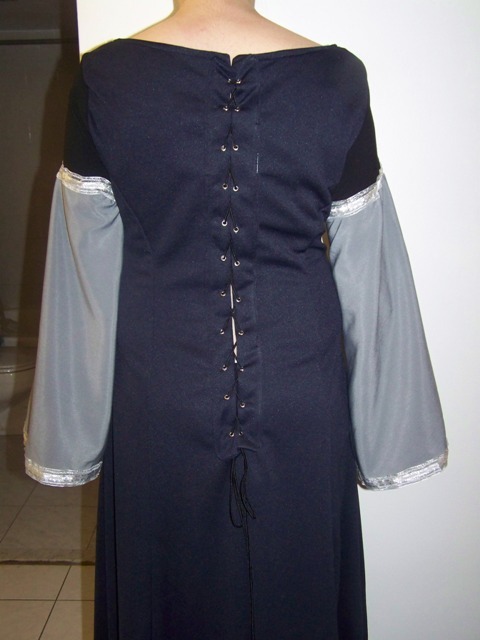 I decided to go with a more dark blue raiment then grey because grey is depressing. There will be two parts to the gown, the under gown and the over gown. I drafted many different patterns for this character, all revolving around the same colour theme of dark blue/silver. I didn't want to go by Tolkien's description 100% because I don't like the colour grey. I figured that if I had the character dressed in darker colours rather than just grey then it would still fit with the character's description. I tried many different designs of the under gown. An earlier version of it included long sleeves that went to the floor and opened up along the front "seam". Another version had a full trumpet shaped sleeve. The over dress was always a sleeveless, lighter gown. At first I wanted it to be heavily beaded to reflect the stars at night. I decided against that design because I have never beaded in my life and I didn't think doing a whole gown was a idea to start with. Under Gown: I used the pattern M5499 from McCall's to make the gown, with a few alterations. 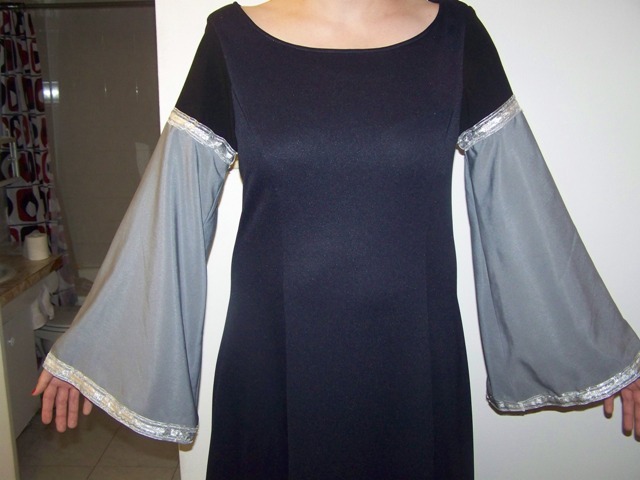 I bought a really really dark, almost black, navy blue material (I think it's a sort of crepe) for the main body of the dress, a grey lightweight fabric with a nice drape to it for the lower sleeves and I used leftover black crepe from the Shredder cosplay for the upper sleeves. I bought a white organdy ribbon for the trim. 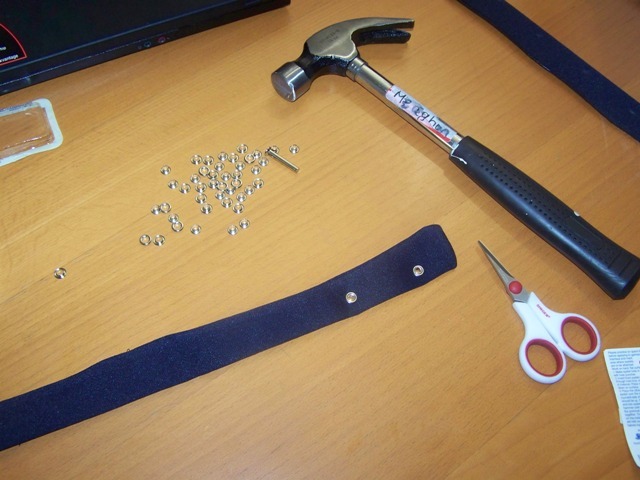 Instead of having trim around the neck and having the neck slash, I just left the neck plain and simple. I also didn't make the belt or the hat. I used silver 4mm eyelets. My friend helped me figure out how to attach them to the back bands as apparently I can't read instructions :P. I used a thin flat black cord for the lacing. This gown turned out quite nice and was easier to make than the Vana gown. I hope to get a photo shoot done soon.